Forget about the boring ham and cheese or the peanut butter and jam sandwich you threw together just to get something in your gob. Feast your eyes on this gorgeous roasted red pepper sandwich. I know… doesn’t it look delicious? It was! I’m a huge sandwich lover so when my wife suggested we make a roasted red pepper sandwich stuffed with triple brie, ham and a pesto mayo I was up for her sandwich spread idea. My wife is one of those people who comes up with odd mixes of food but I always taste everything. The last sandwich I tested that she told me was amazing turned out to be peanut butter and banana with honey which I wasn’t a huge fan of. I like peanut butter but only inside cookies or other baked treats. I didn’t grow up on the stuff like she did although our son seems to love eating peanut butter by the spoonful. Luncheon meats and cheeses on the other hand, I ate plenty of so I knew I was safe with this roasted red pepper stuffed sandwich recipe idea. It’s not often I get the chance to eat sandwiches because when I’m at work I typically bring a hot meal with me since I work such long shifts. The microwave is my friend but when I come home the kitchen is my haven which means I can create whatever I like provided we have the ingredients. Anytime we create a meal we often do a kitchen sweep of the pantry, freezer and any other hiding spots to see what we have on hand. After doing a freezer inventory we pulled out some red peppers that we had cleaned and sliced. What are the best red peppers to roast? I like just about any red pepper out there but I prefer the Red Bell Pepper which you can easily find at any grocery store. Out of season you will pay up to $3.99lb or more so stock up when they are cheap in the summer and freeze them. Once defrosted I fried them with a bit of olive oil and garlic in a dry frying pan until they were blackened a bit then put them in the oven for about 7 minutes or under the broiler. You can also roast your red peppers on the BBQ or on an indoor grill. Some people char the red pepper on the gas stove-top as well. Once they are blackened you can put them in a plastic bag and the peel will easily come off from the moisture being trapped once you take them out or you can just take the skin off right away. For this recipe we kept the blackened skins on as we like it that way. If you don’t have red peppers in your freezer or refrigerator or you don’t have the time to roast them you can take the easy route and use a jar of roasted red peppers. Shh, I won’t tell. While the roasted red peppers were getting toasty we made some homemade mayonnaise and added in some of our pesto that we made last summer with the extra basil from our garden. I carefully sliced some gorgeous triple brie which is creamy and hard to resist. If we had prosciutto which is an Italian Dry Cured Ham I would have used that but to be frugal with this sandwich using a nice sliced ham is the route we took. We layered the pesto-mayo, roasted red peppers, triple brie and ham on some good quality bread and toasted it in the oven for a couple of minutes to melt the cheese. If you make homemade bread or prefer something different you can use whatever you like. I do prefer a softer bread with roasted red pepper because the Italian rolls or panini are a bit harder and rip the peppers out when you take a bite. When I have time I make homemade olive bread which would be perfect for this roasted red pepper sandwich. A lovely roasted red pepper sandwich stuffed with good quality ham and triple brie and slathered with homemade pesto mayo on two premium slices of bread. Slice your red peppers and take the seeds out. Give them a wash and a pat dry. In a frying pan add a tablespoon of extra virgin olive oil, salt and minced garlic. Remove from oven and peel the skin from the roasted red peppers or keep the skins on like we did which are equally as good. Slather 2 slices of quality bread with pesto mayonnaise (just mix the 2 together) on one side of the bread, add slices of ham, triple brie and finally the roasted red peppers. Add salt and pepper as desired. If you have a panini press you could easily press this or put it back in the oven under broil for a couple of minutes to melt the triple brie and heat it up. Presto...enjoy your Italian Roasted Red Pepper Sandwich friends. Every time you think about making a sandwich try to come up with new recipe ideas to jazz up your favourite flavours. Add a thin slice of apple or hemp seeds to your peanut butter sandwich or a slice of crispy bacon to add texture. Greens are a great way to add nutrition to a sandwich so stuff some lettuce greens, spinach or arugula in between your bread. If you’re a fan of rapini,boil it and sautee with olive oil, garlic and salt then stuff in between some fresh Italian bread.Trust me on this one, it’s amazing and they even sell these at Fortino’s at the lunch counter. You can create many types of sandwiches that will take your lunch from bla to wow!! 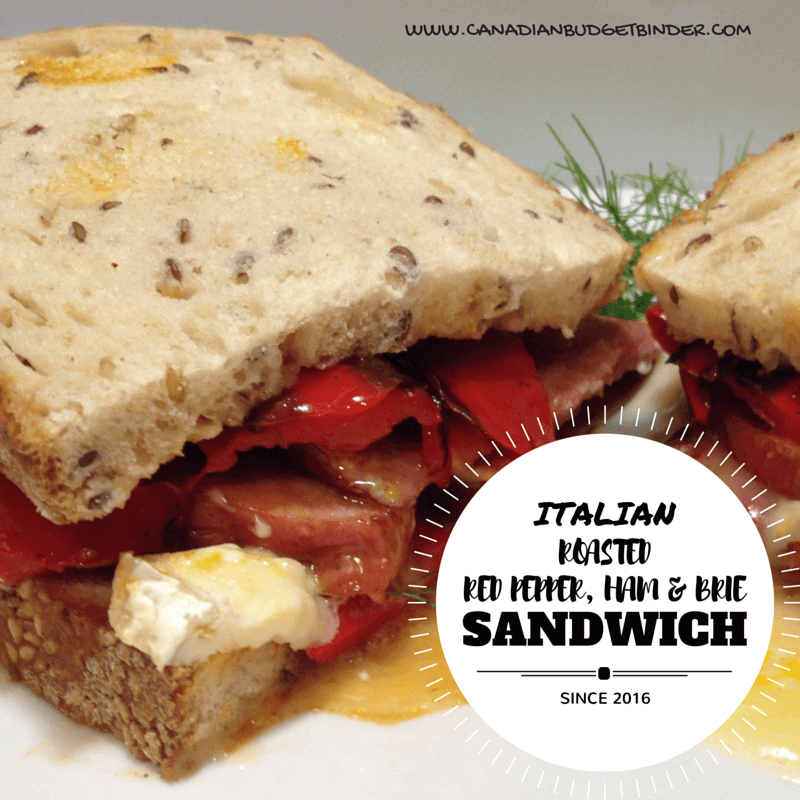 Since this is the first sandwich on the blog I’ll start working on more to keep you drooling!! Yay! That sandwich looks so special! I know kids would surely love this kind of sandwich and I would add some ham and veggies to make it extra healthier. This sure looks interesting!!! I’ll have to start thinking of different things I can toss together for sandwiches here for varieties sake!!! Meals here get into some deep ruts with a certain fussfart to try to feed….. Thanks for the idea !